Have you ever wondered what it would be like to have grown up in another country? This thought came to mind after discovering this website, "60 ans de prenoms en France" (60 years of first names in France), that dynamically graphs and compares the popularity of names from 1950 through 2010. Just for fun, I compared my name plus other renditions of "Emily," then the closest I could find to Marcus (I guess "Marcus" is just too Roman for even the French). 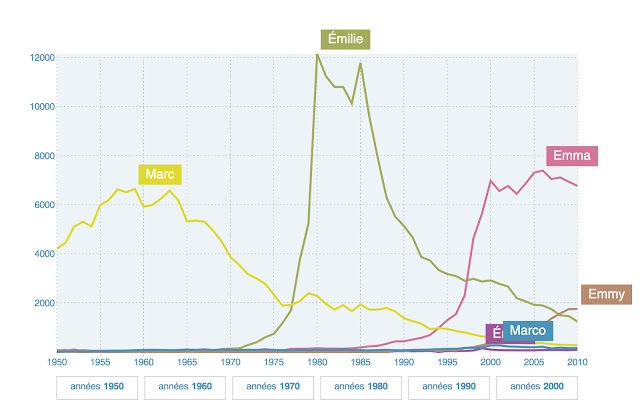 I already had known that my name was quite popular in the States around the time I was born in the 80's, but it looks like it was a more global - or at least, European - phenomenon. And if any of you is looking to see if your (or your kid's or future kid's) names will work out well in French, well, now you have a way to figure that out! If you are more of an Anglophile, though, check out this site, which has a similar kind of live graphing of names in England and Wales (but only runs as far back as 1996, so I'm a bit old for it ...). Thanks to Clotilde of Chocolate & Zucchini for pointing her readers to this fun little site.